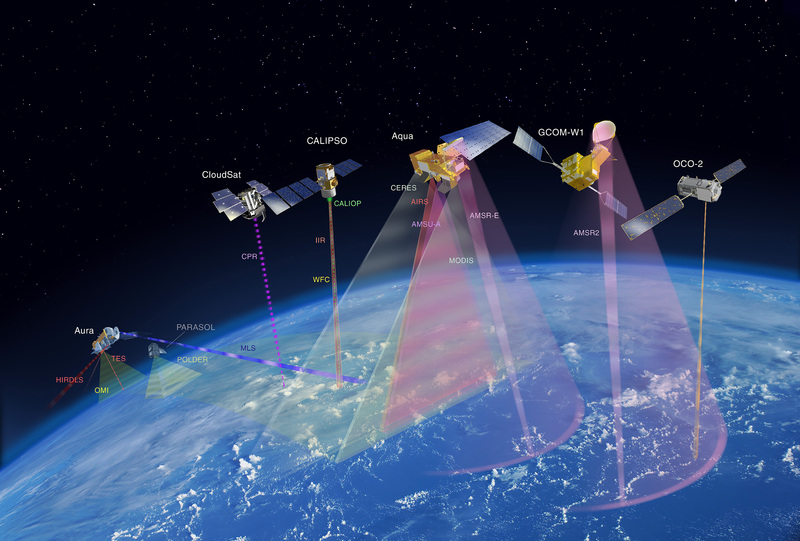 Because NASA has many Earth-observing spacecraft in orbit, it is more efficient to operate these spacecraft in groups, as opposed to single entities. Enhanced formation flying technology enables a large number of spacecraft to be managed with a minimum of ground support. Formation flying enables many small, inexpensive spacecraft to gather concurrent science data in a "virtual platform." This concept lowers total mission risk, increases science data collection, and adds considerable flexibility to Earth and space science missions. In particular, the science output from the Aqua mission is enhanced through coordinated flying with several other satellites that are obtaining complimentary data sets. These other satellites are OCO-2, GCOM-W1, CALIPSO, CloudSat, and Aura. Because prior to the launches of GCOM-W1 and OCO-2 this group of spacecraft had started with Aqua and ended with Aura, the constellation is known as the A-Train, more formally know as the Afternoon Constellation, due to the early afternoon equatorial crossing time. Additional information can be found on NASA's A-Train website.